Photographer Devin Allen, photo by Adrian O. Walker. It’s one of the most storied moments in a photographer’s career — that moment of epiphany that comes with owning a camera for the first time. A young Ansel Adams, for instance, received a Brownie box camera during a family vacation to Yosemite at age 14, a gift that allowed him to capture some of the landscapes that would later make him famous. As a boy, Henri Cartier-Bresson likewise got a camera from his parents, laying the groundwork for him to become a master of candid photography. But that’s not an opportunity Devin Allen sees many of the kids in his neighborhood getting. Back when he was their age, growing up black in West Baltimore, he felt he had limited options for success. He thought about being a rapper, a drug dealer, maybe even a basketball player. But photography? That wasn’t even on the radar. “Where I come from, I didn’t know any photographers,” Allen, now 29, told ivoh in a recent interview. When he finally did pick up a camera — first to help his friends promote their events, later as an aspiring artist — he encountered more than a few raised eyebrows. “A lot of my peers laughed at me. They took it as a joke. No one took me seriously,” Allen said. But then one of his photos landed on the cover of Time magazine. It was the start of a dizzying ascent to celebrity in the highly competitive sphere of photography. But when Allen reflects on the whirlwind of events that brought him to such fame, one anecdote immediately springs to mind — the one about buying the very first camera that was all his own. It was 2013, and he had to borrow his grandmother’s Best Buy credit card to make the purchase. He couldn’t have afforded it otherwise. That moment — and the doorways it opened for the young artist — served as inspiration for one of Allen’s most personal projects: a series of workshops, aimed at putting cameras into the hands of Baltimore-area youth. Allen named the workshop project “Through Their Eyes.” He sees it as an opportunity to even the playing field, so that other young photographers, from hardscrabble neighborhoods like his, can also achieve success. “I look at some photographers, and their daddies were photographers or they took photography classes, and they had all these opportunities to be subjected to photography. We don’t get that chance,” Allen said. Much has been made of the democratization of photography — the idea that, with so many cellphone cameras and social media as an instant publishing platform, almost anyone can be a photographer. But as Allen knows firsthand, the professional field remains competitive. It’s not easy to succeed, especially when you’re struggling, making 12 dollars an hour, with a daughter to care for. In some ways, Allen is the perfect symbol for the opportunities that new media promises. He was, after all, discovered through his Instagram account. 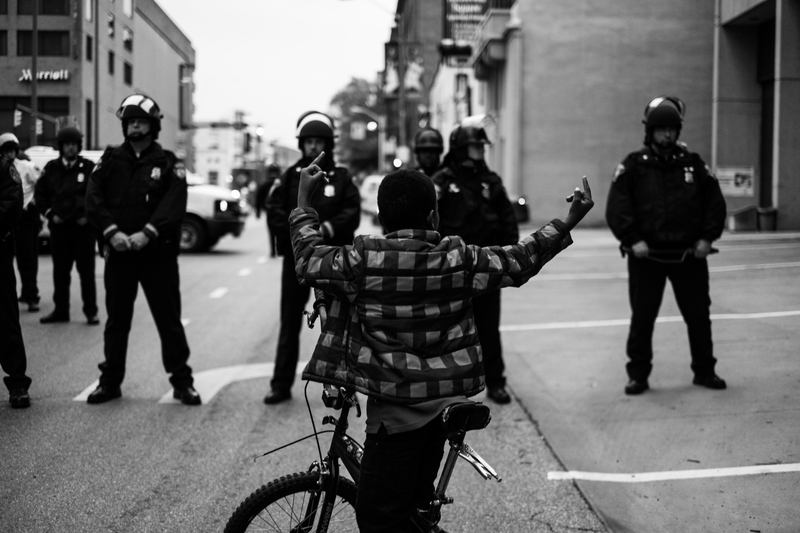 The photos he posted during the 2015 Baltimore uprising became viral hits, shared again and again by influencers like the singer Rihanna. The city had erupted in anger over the death of 25-year-old Freddie Gray, a black man whose spinal cord snapped while in police custody, and Allen was on the street with the protesters, capturing their pain in real time. Baltimore. Photo by Devin Allen. Shot mostly in black and white, his images relayed defiance and anguish in equal measure. One showed a child with arms raised in protest. Countless others showed tear-stained faces. The most famous of all — the one that landed Allen the Time cover — depicted a man in mid-sprint, running away as a line of riot police advanced on him. It was only the third time in history that Time had featured an amateur artist’s work on its cover. The move garnered Allen plenty of praise — and no small amount of blowback. That’s not a criticism Allen takes lying down. He knows there are people who believe his Time cover was little more than a “lucky shot,” who believe he’s unqualified because he never got a college education or any formal training. Photography had shown him how powerful his voice could be, and he wanted to help others come to the same realization. About a month after the uprising ended, Allen set up a GoFundMe page to finance a program that would give cameras to kids. He also put out a call for camera donations. Hip-hop mogul Russell Simmons offered him a $20,000 grant, Allen recalls, and when that ran out, Allen’s own money went into the project. He even gave away his own camera, confident that one day he could afford another. But for all the attention the Time cover brought, money was still tight. Allen had photography jobs here and there, including a gig with The New Yorker, but it was ultimately the apparel brand Under Armour that gave him the financial security to pursue his passions. “If I was shooting journalism right now, I’d be broke. I wouldn’t be able to pay my bills,” Allen said. His work with Under Armour took him to Asia to photograph basketball star Stephen Curry — a trip that marked Allen’s first time abroad. All the while, Allen continued with his plans to help youth learn photography. His first workshop took place at the Kids Safe Zone at the Penn North Community Resource Center, and as Allen describes it, the lesson was pretty spontaneous. He remembers starting out with 15 to 20 students that day, but when he returned for a second session, that number had dwindled to about five. Allen wasn’t discouraged, though. The small class size turned out to be an advantage: It allowed him to build personal relationships with each of the kids. Sometimes they’d call him up, just to chat. “I was out having a drink with some of my friends — it’s like eight o’clock on a school night —and my kids FaceTime me, asking, ‘What you doing? We gotta hang out soon,'” Allen said, laughing. Soon, Allen was expanding his program, visiting youth from one coast to the other. In Harlem, New York, he helped teach kids how to use film cameras, and just last month, he held another photography workshop in Oakland, California. But his focus, as always, remains on Baltimore. There, poverty is estimated to affect 22.7 percent of the population. Violence has hit historic highs. As of October 18, the number of homicides in the city had reached 285, on pace to make 2017 another record-setting year for crime. For Allen, those numbers have helped contribute to a feeling of inferiority throughout the city. “That’s the biggest thing coming from Baltimore: People always look down on us, or they feel sorry for us. But we are proud to be from Baltimore,” he said. The photographs his students take speak to that pride. Some capture the light filtering through trees. Others are portraits of a best friend or a favorite dish. One kid found his muse by photographing all the locks and broken glass he could find, while another sees the pictures as a springboard to write poetry. But Allen knows firsthand the obstacles that many of the kids face in their personal lives. At their age, he hung out with drug dealers, sometimes running drugs himself. Back then, he didn’t know if he would live to see his 21st birthday. At his workshops, Allen says he readily acknowledges his history with the drug trade. He wants his students to know that they aren’t stuck in that lifestyle, either. For Allen, photography was nothing short of a lifesaver. One Friday, early in his photography career, he chose to stay home to edit some snapshots he’d taken. That same night, one of his best friends got shot to death. The following night, another friend was too. Allen mentors a wide range of kids in his photography classes — some as young as six, others with autism and intellectual disabilities — but he recognizes some of the faces in the groups he works with. One young lady knew Allen’s best friend before he got shot. Allen had taken a picture of her cousin shortly before he was killed too. But nevertheless, Allen is confident that other young photographers will emerge from his workshops. He looks forward to the day when he can recommend them for photography jobs — or even hire them himself. Promoting voices like theirs is an important way to change the narrative surrounding Baltimore, says D. Watkins, one of Allen’s friends and collaborators. This past summer, the two men put together a two-day youth workshop that was underwritten by the energy drink brand Red Bull. “It’s like we’re laying the foundation,” Watkins told ivoh. He believes there’s something lost in the overwhelmingly negative depictions of his hometown — namely, the everyday humanity of its people. But until they do, Allen is investing his time and energy in creating the next generation of storytellers. One that knows the city, sees its beauty and feels its pain.